6 Vintage Czech 'Sugared' Glass Beads in Caramel/Honey Colour; made in approx. 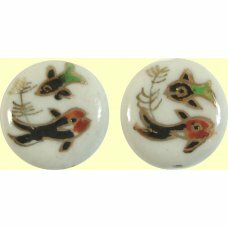 1940s, these barrel s..
2 Painted Ceramic Fish Beads - disc shaped beads measuring approx. 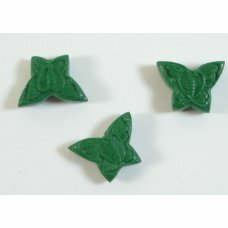 19 x 6 mm, detail on both sides, ..
10 Green Resin Butterfly Beads - perfect for earrings, hole top to bottom through the middle, the be..
1 Plastic Shamballa Style Bead Dark Pink hole in the middle for stringing measures approx. 13.5 mm. ..
1 Czech Glass Silver Foiled Oval Bead Ruby. Measures approx. 12 x 8 mm. ..
1 Krystal Wick Fuchsia Sparkles Batik Wrap Bead great for earrings light as a feather measures appro..
1 Czech Glass Silver Foiled Oval Bead Teal Green. Measures approx. 12 x 8 mm. ..
1 Krystal Wick Red Gold Batik Wrap Bead great for earrings light as a feather measures approx. 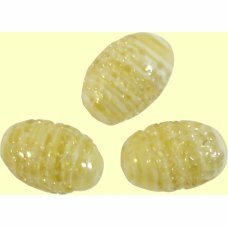 39x6m..
1 Czech Glass Silver Foiled Oval Bead Clear. Measures approx. 12 x 8 mm. ..
1 Krystal Wick Olive Gold Batik Wrap Bead great for earrings light as a feather measures approx. 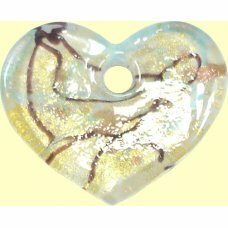 39x..
1 Resin Clip On Charm Donut; strictly NOT for eating. With silver plated clasp. The charm measures a..
1 Krystal Wick Purple Gold Batik Wrap Bead great for earrings light as a feather measures approx. 39..
1 Resin Clip On Charm Chocolate Bar; strictly NOT for eating. With silver plated clasp. The charm me.. Bright Painted Wood Beads Necklace wear as is or take apart for your own creations. The largest bead..
1 Resin Clip On Charm Strawberry Blancmange with Chocolate Topping; strictly NOT for eating. With si..
3 Strand Green Multi Wood Bead Necklace wear as is or take apart for your own creations. Pretty pain..
1 Plastic Shamballa Style Bead Mid Green hole in the middle for stringing measures approx. 13.5 mm. ..
1 Clear Glass Triangular Long Bead with White Lining with Goldfoil Band and Flower Detail ..
1 Plastic Shamballa Style Bead Teal Blue hole in the middle for stringing measures approx. 13.5 mm. ..
1 Turquoise Triangular Long Bead with Goldfoil and Flower Decoration. Pretty bead with hole running ..
1 Czech Glass Silver Foiled Oval Bead Rose. Measures approx. 12 x 8 mm. ..
1 Krystal Wick Aqua Sparkles Batik Wrap Bead great for earrings light as a feather measures approx. ..
1 Czech Glass Silver Foiled Oval Bead Sapphire Blue. Measures approx. 12 x 8 mm. ..
1 Czech Glass Silver Foiled Oval Bead Green. Measures approx. 12 x 8 mm. ..
1 Krystal Wick Rose Sparkles Batik Wrap Bead great for earrings light as a feather measures approx. ..
1 Resin Clip On Charm Chocolate Biscuit; strictly NOT for eating. With silver plated clasp. The char..
1 Krystal Wick Teal Sparkles Batik Wrap Bead great for earrings light as a feather measures approx. ..
1 Resin Clip On Charm Chocolate Cake; strictly NOT for eating. With silver plated clasp. The charm m.. Pink Mother of Pearl Twist Necklace; mother of pearl beads interspersed with glass pearls and silver..
1 Resin Clip On Charm Strawberry Ice Cream; strictly NOT for eating. With silver plated clasp. The c..
3 Strand Black Multi Wood Bead Necklace wear as is or take apart for your own creations. Pretty pain..
1 Resin Clip On Charm Cupcake; strictly NOT for eating. With silver plated clasp.with silver plated ..
1 Opaque Pink Triangular Long Bead with Goldfoil and Flower Decoration ..
Clear Glass Long Bead with White Lining with Goldfoil Band and Flower Detail ..
1 Czech Glass Silver Foiled Oval Bead Turquoise. Measures approx. 12 x 8 mm. ..